A senior Syrian politician underlined that Saudi Arabia supports those sides which oppose the political settlement of the crisis in Syria, and added that the recent suicide attacks in Damascus are one of the alternatives used by supporters of terrorism. “The Syrian sides which oppose the political process are affiliated to certain regional states, including Saudi Arabia, and they reject any peaceful solution to the crisis in Syria,” Secretary-General of Syria’s National Development Party Inass al-Hamal told FNA on Sunday. Noting that the dissidents who obey the Persian Gulf sheikhdoms aren’t representative of people, he said when these Arab states witnessed the failure of their plots in peace talks, they resorted to terrorist blasts in Damascus. 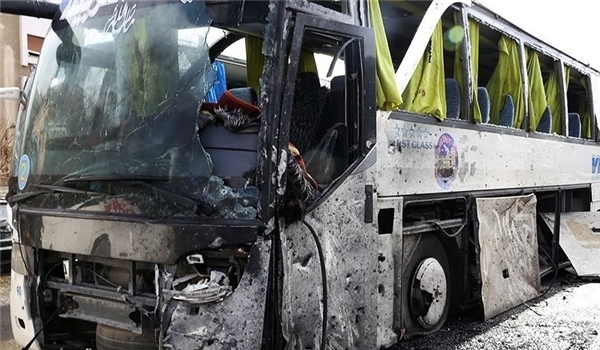 At least 31 people were killed and dozens more wounded after two suicide bomb attacks in Damascus on Wednesday, state media reported, the second double bombing in the Syrian capital in five days. The first suicide bomber targeted the Palace of Justice, the main courthouse in central Damascus near the Old City. The justice minister, Najem al-Ahmad, told reporters the initial death toll was 31, mostly civilians.